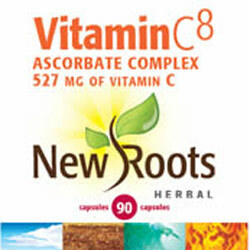 OTTAWA - Health Canada is warning Canadians, especially expectant mothers, not to use two vitamin C products sold under the brand names New Roots Herbal Vitamin C8 and Vitazan Professional Vitamin C Advanced Ascorbate. These products were improperly manufactured using vitamin A instead of vitamin C, exposing consumers to potential risks of adverse events. Capsules may also contain excessively high doses of vitamin A. The maximum recommended daily dosage for vitamin A without a prescription is 10,000 International Units (IU). Consumers taking two capsules of the affected products daily as suggested on the product label, or more, may exceed this amount and could be at risk of serious health effects. Symptoms of vitamin A overdose include headaches, fatigue, appetite loss, nausea and diarrhea. Women in the early months of pregnancy who take excessive doses of vitamin A risk serious birth defects in their unborn children. Canadian manufacturer, New Roots Herbal, has initiated a Canada-wide recall of the two affected lots, which are indicated on the label as LOT 2689 (exp. 08/2012) and LOT 9719 (exp. 01/2012). The vitamin supplements come packaged in bottles of 90 or 180 capsules. Canadians who have the affected products are advised to immediately discontinue use and consult their health care professional if they have related health concerns. Consumers should return the products to the point of purchase or the manufacturer for safe disposal. No adverse reactions related to these products have been reported in Canada. Health Canada will be working with the manufacturer to determine where the products were distributed in Canada and to ensure they are immediately removed from the market. Drugs and natural health products that are authorized for sale in Canada will have an eight-digit Drug Identification Number (DIN), a Natural Product Number (NPN) or a Homeopathic Medicine Number (DIN-HM) on the label. These numbers indicate that the products have been assessed by Health Canada for safety, effectiveness and quality. Consumers requiring more information about this advisory can contact Health Canada’s public enquiries line at (613) 957-2991, or toll free at 1-866-225-0709.